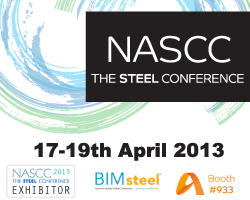 STRUMIS LTD, with our solutions for the steel fabrication industry and AEC sector, is again to participate and support the annual American Institute of Steel Construction (AISC), North American Steel Construction Conference (NASCC), in St. Louis, Missouri, from April 17-19th, 2013. NASCC: The Steel Conference provides a glimpse into the future of technology in steel construction with the Technology in Steel Construction Conference (TSCC). This special track features nine informative sessions that focus on advanced technology use throughout the steel construction industry, from various topics on building information modeling (BIM) to interoperability. Improve efficiencies and increase productivity! STRUMIS LTD will be exhibiting on Booth #933 and welcomes any delegate registered/attending NASCC 2013 to drop by and visit us to see one of our live software demonstrations. We will show all visitors, to our stand, involved in steelwork fabrication and construction, how using our products could result in delivering efficiencies and increased productivity! Product focus NASCC this year! STRUMIS LTD will be featuring its new production planning and scheduling module which is incorporated into the latest release of STRUMIS – steel fabrication management system. Learn how the forthcoming resource planning & scheduling functionality in STRUMIS addresses the complex trade-offs when managing multiple projects with competing priorities through diverse fabrication processes. Our team will be showcasing STRUMIS system for larger and medium sized steelwork fabricators, in conjunction with our new Essentials solution for smaller fabrication shops. We will also be demonstrating our Building Information Modeling (BIM) collaboration software BIMReview and introducing BIMProject our brand new construction BIM management software for procurement and construction teams. April 17- 19th, 2013 in St. Louis, MO, at the America's Center Convention Complex. STRUMIS LTD representative will be in touch with you shortly..
Visit our booth (#933) for software demonstrations, workshop events, promotions and much more! BIMProject is powerful construction lifecycle management software, for procurement and construction teams. The software offers real-time project controls, supply management and construction planning to deliver projects on time, in budget and at reduced risk to stake holders. Our partner focus this year is on SDS/2 Approval - which allows users to implement model review and approval between engineers and fabricators. SDS/2 are in booth #905.